Stain-resistance and ease of cleaning thanks to the hardness of the coating film are the most prominent characteristics of the BC-06 glass coating. This thin silica film made from perhydropolysilazane protects the car body and wheels from dust in raindrops that may penetrate soft paints or other painted surfaces and can be removed only with great effort. Thanks to the BC-06 protection washing is required less frequently. 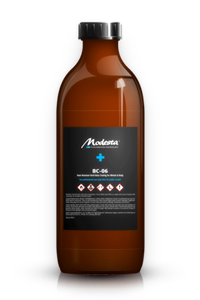 BC-06 undergoes a chemical reaction when it comes in contact with a painted surface, creating a hard glass coating. It has a tightly packed molecular structure that creates a solid, long-lasting surface. BC-06 is heatproof up to 1,300 °C - enough to protect wheels from burning-hot brake dust. This coating is applied with a paint gun with a nitrous oxide propellant.